When milk is mixed at the processing plant it is called homogenization. The mixing process is so thorough there is no separation of fat from the liquid. The cream no longer rises. This process is similar to what happened in the public school system when my oldest child began kindergarten twenty-five years ago and this scheme continues to this day. Where there used to be “levels” between classrooms of children, meaning there were the high achievers/high intelligence children in a classroom, the average children in a classroom, and the lower/slower learners. The year my son started, they did away with this. The idea being that the lower/slower children left school with low self-esteem. The result of this experiment was that there were no “upper-level” classes and “lower-level” classes any longer. However, if the child were to be tested and passed as “gifted and talented” there were classes available for that child. In theory children mixed together encourage the low-ability children to catch up to the high-ability children. 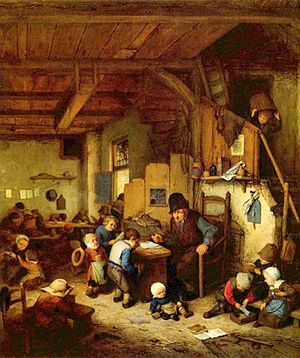 The teacher was to teach to the higher level children and the low-level children would simply work harder. They would learn to be equals. A fine example of the “liberal” thinking of the board of education. Humanism at its finest. As you might guess it didn’t and doesn’t work like that. You can’t throw enough money at children to make them into something they can not be. The homogenized classroom is full. This usually means between 23 and 25 kids in a classroom in grades k thru 3rd and in 4th and 5th grade there may be 30 kids in a classroom. I’ve seen a classroom of 22 fourth-grade kids split up and the teacher reassigned to a different school. This is to justify the numbers and the monies allowed per teacher and classroom per campus. I will explain how I know this first hand in another blog. The average child can read and write by the second grade. In a classroom of 25 children there will average ten children who are far ahead of everyone else in ability and there will be ten children who are far below the other children’s ability. That leaves about five children who get it and are able to keep up with the upper ability kids. The children who are ahead are loaded down with busy work. While the teacher is re-teaching the other children, they must work on that busy work. By the second grade most of these kids have figured out that what they have been given is busy work. These smarties are likely to race ahead, finish everything and then proceed to disrupt the entire classroom. They are bored. Bored children are not well-behaved children. At this point they are not able to figure out on their own that there are other things to accomplish, other books to explore, other concepts to delve into. They are simply bored. This can carry on into middle school and high school. My experience has been that if a bright child in high school who is bored and who is not involved in sports will experiment with drugs, just saying. This homogenization of children might have seemed like a good idea at the time. After all, we certainly don’t want any children with low self-esteem(!). But the problem is that the process only created more specialization teachers to be trained for pulling out the low-ability children, and do you not think these children KNOW that they are not the same as the other children. Of course they do. They may not be able to do the math or the language arts but they sure as heck know that they can’t keep up. And what about the self-esteem of the brighter children who now must get fussed at for bothering the rest of the class because they are finished with their busy work? Don’t you just love that your children are the guinea pigs being used for all sorts of educational experiments? After my children went through one of the country’s top-rated school districts (and the most culturally diverse) the only thing standing between them and a good college education was their lack of education and the ability of their mom and dad to write a check. I will write more about gifted and talented and the special needs children in public education at a later date. Ouch! I can’t wait for your next post about this subject You are very concise and clear, and you line up with my own opinions!